Paper Bead Templates speed up the paper bead making process if you are a crafter who likes to create your own bead strips. If you are fed up with measuring and drawing out triangles - the paper bead templates in this kit will be perfect for you. 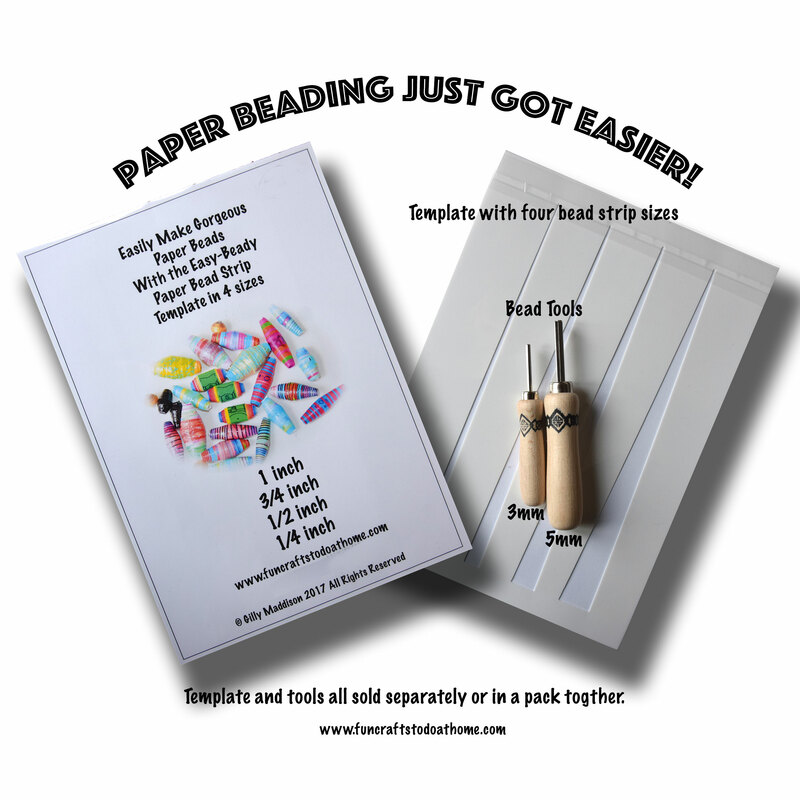 And the two paper bead rolling tools that come with the kit save you even more time because they are easy to use; when used properly, the tools will result in paper beads that are firmly wound and come off the shaft of the tool with ease. If you have landed here and you haven\'t see my video over on YouTube where I use the paper bead templates in a project, click here to go see the video. But don\'t forget to come back to see where to get the kit. And if you have landed here from YouTube and want to know where to get the paper bead templates and paper bead tools, click here to go to my Etsy shop. For links to the individual products, see the Etsy links at the end of this post. When I first started making paper beads, many years ago, I didn\'t have anything like these paper bead templates to help me along. Looking back, I can\'t believe how I used to spend hours measuring out dots along the top and bottom of sheet of paper and then go through the boring job of making the lines. So I started making my own paper guides to copy but it was still time consuming. Then I thought how brilliant it would be if I had a sheet containing all the template sizes I use regularly - but all I did was dream about it. Eventually, because I needed to speed up the part of my paper bead making workshops where people create their own strips to hand color, I spent ages trying to make a sheet of four paper bead templates that I could reproduce without massive expense. I wanted my students to be able to use the paper bead templates in the class and then take them home. And that was how my paper bead templates were born. My paper bead templates are so easy to use - and once you have cut your strips, you can use either of the two paper bead rolling tools to roll your beads. The four templates on the single sheet have base sizes of 1inch, 3/4inch, 1/2inch and 1/4 inch. To use the them, you simply turn the sheet over, run some strips of removable sticky tape down in between the templates and then gently stick the sheet to whatever paper you are using for your paper beads. Whatever your chosen bead strip size, you simply lightly draw inside the relevant triangle template with a very sharp pencil (and it must be lazer sharp) in a color that will be easy to see for cutting. You can repeat this across your paper, carefully positioning the sheet to maximise the use of the paper's surface area. The two paper bead rolling tools that come with the paper bead templates make core holes of either 3mm or 5mm. The 3mm tool is used to make beads with a smaller hole that will take finer threading materials such as beading elastic or cord. The 5mm tool is used to make beads with a larger core hole to take a thicker threading material such as the bracelets used to make European Style jewelry. The 5mm tool is ideal for people wanting to make beads that have the same shape and look as beads seen on Pandora bracelets but with a teeny fraction of the cost! Please note - you will need a separate paper template to make European Style beads like these. You can download the template from my Etsy shop. If you want to make beautiful, creative paper jewelry, these tools are ideal for anyone just starting out. And once you get going, you can really let your creativity run wild dreaming up ways of making junk mail look really pretty! You can make gorgeous handmade gifts that people will love and wear, instead of putting them in a cupboard feeling annoyed that you gave them some second rate homemade tat! You can even make beautiful pieces to sell at craft fairs or online. Once you have bought these tools, the costs of making beads is reasonably low because you can use throwaway magazines, brochures, booklets, even books to make your paper beads. Have a look at these previous posts to see what sort of jewelery you can make. How to add cores to European style paper beads. How to make a paper bead charm bracelet. If you go over to my YouTube channel, don\'t forget to subscribe and hit the bell icon to get regular updates when new videos are posted. And remember to visit my craft supplies page on Amazon to get many of the products I use in my projects plus lots of other crafting supplies. Have fun making beads - the Easy Beady tools and paper bead templates really do make your crafting life much easier - I know, that\'s why I designed them - happy crafting! Previous Previous post: Craft Printables For Unique Creative Ideas – Make Cool DIY Necklaces From These Craft Printables & Cardboard! Next Next post: Alcohol Ink Jewelry – Paper Beads With A difference.